Our Service department has been designed to keep up with the demands of our customers and the current farming trends. We have a dedicated team of fully trained Technicians ready to service and support all the main franchise products in our trading area. Our technicians have fully equipped service vans along with the knowledge and expertise to carry out any kind of repair on any machine anywhere. Specialist tooling, diagnostic laptop computers and calibration equipment are vital to meet the ever-increasing technology of today’s agricultural machinery. We have a large six-bay workshop where six staff work to keep your machinery in tip-top condition and we also have fiive fully-equipped service vans on the road to assist with breakdowns in-situ to get you up and running as quickly as possible. We also service and repair all types and makes of garden machinery, from lawnmowers and ride-on mowers to chainsaws, to ensure your garden machinery is kept in peak condition. We can provide out-of-season servicing at great prices too. This is a perfect way to get your garden machinery serviced and checked over in preparation for the season ahead. We can offer a local collection and delivery service for some types of garden machinery. For more information please contact our service department who will be glad to help. Not only are we approved main dealers for Suzuki, Kawasaki, Quadzilla and Arctic Cat quad bikes, but we also have a dedicated well-equipped and spacious quad bike service centre. Within this centre, we carry the specialist tools required to service these machines and we have a hydraulic lift for ease of working on these machines and to allow us to easily manoeuvre around and underneath the quad bikes so that we can spot any problems promptly. 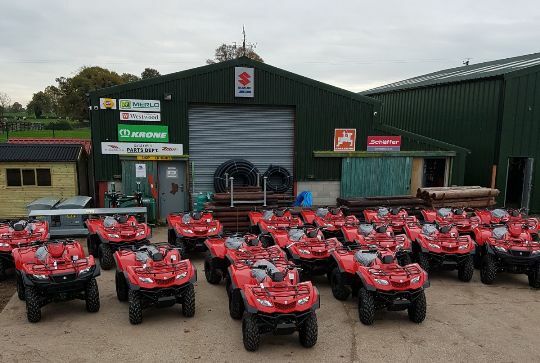 We can service and repair ALL makes of quad bike and we are incredibly competitive to ensure you always get the best service at the best value for money prices. For all your Farm Machinery, Garden Machinery and Quad Bike repairs and servicing give us a call on 01625 422489 or contact us now and let us take care of all your machinery.